League of Women Voters attorney David King arguing at Wednesday's hearing. The League vows to continue its fight. 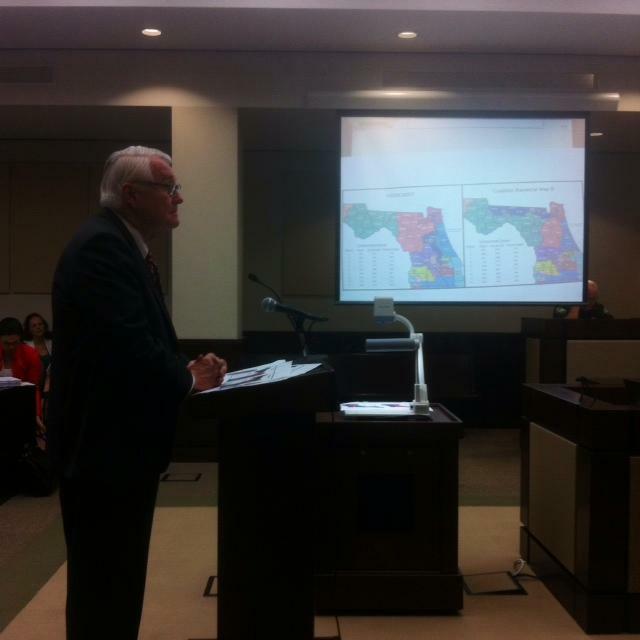 Stakeholders in Florida’s redistricting fight appeared in court Wednesday. The subject of debate? A new congressional map drafted and passed by the Legislature earlier this month. For anyone who’s not up to speed on the issue, here’s a refresher: after a protracted legal battle, Circuit Judge Terry Lewis ruled two of the congressional districts that came out of the revision in 2011 violated Florida’s constitutional fair districts provisions. He ordered the Legislature to redraw the map, and it completed its changes August 11. Wednesday’s hearing gave voting rights groups a chance to respond. Attorneys for the plaintiffs argue the new maps do little to address the concerns that led Lewis to call for a new map. District Five runs on a north/south axis from Jacksonville to the Orlando area and borders District Ten – the other invalidated district – in the Central Florida region. In the unconstitutional version of the map, Lewis pointed out a number of so-called “appendages” on these districts that seemed to pack Democratic-leaning, African-American communities into Five, thus making Ten more reliably Republican. The revised map removes these appendages, and attorney for the Florida House George Meros says that’s all the judge asked the Legislature to do. “This court identified two problems. We addressed them completely and precisely as the court ordered. And in doing so, we – I say the staff – made a remarkable, successful effort to improve District Five and the surrounding areas,” Meros says. But attorneys for the plaintiffs say if District Five ran east to west rather than north to south it would allow for more compactness throughout the state and greater minority representation in Central Florida. King questioned Harvard Professor and electoral map expert Stephen Ansulabehere about a map proposed by the plaintiffs with an east/west District Five. Under this proposal, Ansulabehere concedes District Two is less compact than the Legislature’s map, but every other affected district performs better in three commonly used compactness metrics. Also, the plaintiffs argue the newest map was one-sided in its construction – crafted behind closed doors by Republicans before the Special Session even began. Attorney John Devaney presents this problem in an exchange with House Minority Leader Perry Thurston. Meros shot back that Democrats did not invite Republicans to participate on a competing proposal offered by Sen. Darren Soto (D-Kissimmee). Judge Terry Lewis closed the hearing shortly after noon Wednesday with a promise to render his ruling soon. Late Friday, Lewis made good on that promise, releasing a ruling upholding the legislature’s new map and allowing this year’s elections to proceed under the borders previously ruled unconstitutional. Challenges are expected to follow.